A trip to the local public library might come with a surprise. 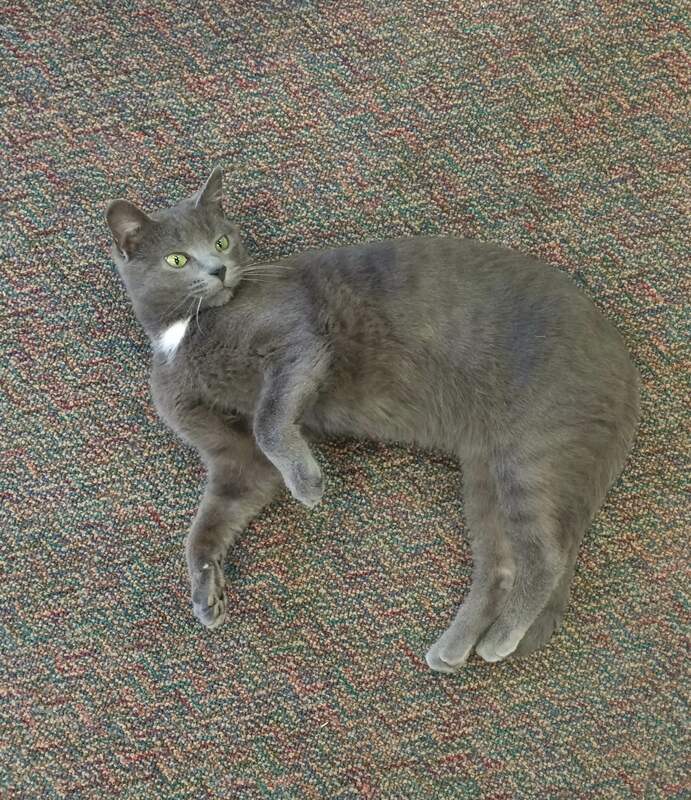 Instead of the quiet hustle and bustle of patrons and fellow human employees, you might be greeted by a gorgeous grey cat with piercing green eyes. Tom Sawyer can be found hiding on low book shelves, napping on the library’s carpeted floors, or walking around greeting patrons. Tom first visited the library on Feb. 8, just four days after his rescue on Feb. 4. His new human caretaker, library Director Kathy Watson, brings him to work with her everyday, and takes him home with her at night. He was rescued off Red Lick Road, on the Madison County side, by Kathy’s daughter-in-law, Courtney Watson. A trip to the vet revealed that Tom had indeed been injured, as a kitten, and had learned to cope with his injuries that particularly affected his hips and back legs. The Watson’s feared if Tom was taken to the animal shelter, he wouldn’t get adopted because of his injuries and would eventually be put down. When Tom was first found by Courtney, he was starved, weak, and pitiful. He couldn’t jump and didn’t play. Kathy said he has came so far already. “As he has gained strength, we continue to celebrate every time he does something new,” Kathy said. She recalled the first time they saw him playing. After placing a table cloth on a table for a library board meeting, Kathy said she saw Tom batting at the edge of the cloth that was hanging off the table. You can tell the love that employees have for this tough little cat. 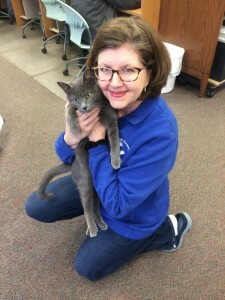 At first, Kathy brought Tom to the library with intention he could stay until he found his forever home, but now, she say’s she doesn’t know if she could let him go. Courtney couldn’t keep him because she already had one cat, and Kathy said she had never wanted a cat in her home. One thing led to another, and Kathy adopted Tom into her home… and her life. “Through the decline in health, and loss of my father, Tom has been very therapeutic,” Kathy said. She laughed, saying that if she tried to get rid of him now, her staff members might never speak to her again. Tom is now a staple to the Estill County Public Library. He enjoys being petted and talked to, and hanging out with patrons and employees as they roam the shelves. He will even make appearances at story time, where the kids are crazy about him. Kathy said if Tom ever gets too much loving, he never gets combative or aggressive, but he will retreat to one of his hiding spaces for some alone time. Tom, the cat with a literary, but not too “high brow” name, is as much a part of the library’s make up as any other person who walks through the door. The cat has the most loving and gentle personality only a rescue cat could have. It’s like he knows he’s been saved. Now he has a loving home, a job, and many patrons who look forward to seeing his whiskered face during their visits.